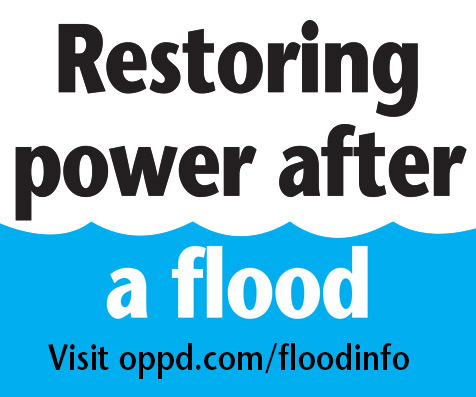 OPPD line technician Randy Marks is one of those guys who wants to know how everything works. Curious and creative, Marks, remembers being a boy growing up in Omaha, peering out a backyard window and watching a lineman working high on the pole restoring power after a snow storm. The lineman fascinated him. Years later, Marks is the one up on the pole working to restore power. And when he sees kids below, staring up at him, he makes sure to stop and talk with them. Growing up, Marks was an admitted nerd, a kid who sought out all kinds of knowledge. He was always good at drawing. For a time, he wanted to be an architect, but a cousin cautioned him against pursuing art as a career because it could spoil that feeling. Art is still a passion. He does graphic design when he isn’t at work or spending time with his wife and two teenaged daughters. His other passion is racing road bikes, and he likes to get outside and ride whenever the weather allows. Marks hopes to do more graphic design when his days a line technician are over. But he’s thankful he found a career that is such a great match for him and loves the life his career has helped him provide for his family. 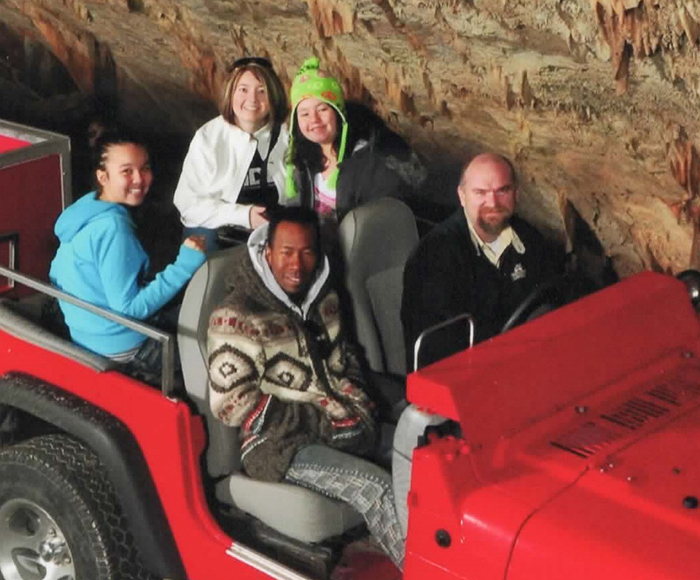 Randy Marks and his family on a trip exploring underground caves in Springfield, Mo. From left is his daughter, Gabrielle, wife, Megan, and daughter, Isabella. His path to OPPD included other stops along the way. After graduating from Omaha North High School, Marks studied art but eventually became a mason. Within a few years, he was studying to be an electrician while working with an uncle installing security systems. He started attending ABC Trade School in Omaha. As an apprentice electrician, he kept running into other electricians working on transformers at a large job site and became interested. The journeyman electrician he worked with told him he would need to get hired by the power company to do that sort of work. That became Marks’ goal. After graduating from trade school, he was hired by OPPD. But it wasn’t easy. He remembers climbing his first pole of climbing class at OPPD, 40 feet off the ground and in 102-degree heat with high humidity. “Those first years I was like a kid in a candy store. It was really exciting,” Marks said. Marks said a lot of people don’t understand what linemen do. There is a great deal of safety training that linemen and other field employees must go through. Each day’s work starts with safety and job briefings, and the crews are always looking out for each other. Marks said the lineman profession has a long, proud history. As part of his job, he also goes to schools and talks to students about the job. One thing he makes clear when talking to others is that the feeling he gets when the restoration is done hasn’t changed. Thank you, Randy, and all the other linemen who are out in freezing cold and blazing heat to keep our lights and power on! YOU ARE APPRECIATED! Bless you and your families who support you, and stay SAFE! Randy is a great lineman and person. Thankyou for all you do! We appreciate you and am proud You part of our family!!! Next Next post: Treat trees for emerald ash borer now. Here’s how.